The attention and teamwork needed to blow glass can be therapeutic, especially for individuals with traumas and injuries that have occurred during military service. 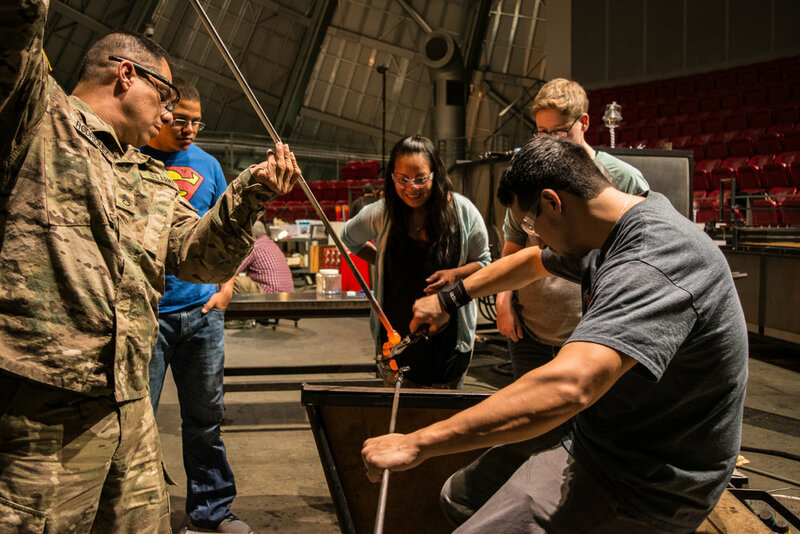 Hot Shop Heroes is a collaboration with the Warrior Transition Unit at Joint Base Lewis-McChord, the American Lake Veterans Administration, and Museum of Glass. The program offers participants an opportunity to take up to two 8-week courses in basic glassblowing. Previous participants have identified the social and emotional benefits of Hot Shop Heroes, recognizing that through the team environment, they have become open to the joy in creating art, coping with anxiety, and interacting with others in a healthy manner. Contact Andrew Henley, Curator of Education, for more program details. Established in 2002, Science of Art is an educational outreach program that helps K-12 students understand and practice the interdisciplinary nature of life. Our recently redesigned Science of Art curriculum approaches real-world problems with tools from artistic and scientific thinking to invent novel solutions. By applying logical thinking, the students involved in the program explore the world with creativity, and deeper understandings of the real world. The new program has 5 distinct units based on the Washington State Science and Arts standards, and takes place over three or four sessions, generally beginning with two visits from a MOG instructor to the classroom and wrapping with a final trip to the Museum. An additional classroom visit post Museum visit is possible. Learn more about the curriculum and tour components of our new program. MOG's Mobile Hot Shop is a fully equipped glassblowing studio on wheels. This mobile studio makes it possible to bring the excitement and creative process of glass to schools and neighborhoods that don't have a chance to visit the Museum. Interested in having the Mobile Hot Shop come to you? Learn more here. Local non-profit, Hilltop Artists, offers glassblowing programs to youth, aged 12 to 20. This tuition-free program is based at Jason Lee Middle School in partnership with Tacoma Public Schools. Hilltop Artists is an active partner at Museum of Glass, being the featured artists on Third Thursdays during the academic year and having an annual Visiting Artist Residency in the Hot Shop to learn with our Hot Shop Team. Additionally, you'll see several Hilltop Artists leading our monthly Blow Your Own Workshops. Discover more about our friends at hilltopartists.org. The MOG Hot Shop is one of a few elite facilities for blowing glass in our area. We're pleased to extend use of our space to UWT, where students are able to take art courses that focus on glassblowing as electives. A new partnership between Tacoma Public Schools and Museum of Glass gives Tacoma public high school students complimentary admission with their student ID cards. Tacoma students can experience the connection between educational content learned in the classrooms and museum exhibitions. We are delighted to collaborate with SOTA faculty in a way that encourages and enables greater access and exposure to the arts. The Museum of Glass is proud to be one of the participating institutions in Culture Kids, a pilot access program of the Arts and Culture Coalition of Pierce County. Culture Kids aims for children ages 0-5 in Tacoma Head Start, ECEAP, and other qualifying institutions to participate in at least five free arts and culture experiences before their fifth birthday. Visit the Arts and Culture Coalition for more information. For the past 12 years, Museum of Glass education staff have offered women housed at the WCCW a variety of art-making classes. Held monthly throughout the academic year, each class features a new craft and offers participants a social connection, creative outlet, and learning opportunity. This partnership brings University of Puget Sound student interpreters to MOG to display and educate visitors about specific creatures highlighted in our programming, such as on Family Days and Iittala Bird Lovers' Weekend. The Tacoma Museum District provides a rich environment for supporting partner institutions. Tacoma Art Museum and Museum of Glass collaborate for Glass Fest Northwest and Chihuly Walking Tours. Additionally, all member institutions collaborate on the annual Educator Night at the Museum. Check our calendar for more details. Be sure to visit all six: Washington State History Museum, Tacoma Art Museum, LeMay - America's Car Museum, Foss Waterway Seaport, Children's Museum of Tacoma, and Museum of Glass. For more details on the TMD, visit tacomamuseumdistrict.org.